Before you complain about what I don't do for you, ask yourself if you're doing it for me. My love is deep; the more I give to thee, the more I have. Both are infinite. Respect is the mirror, the more you show it to other people the more they will reflect it back. 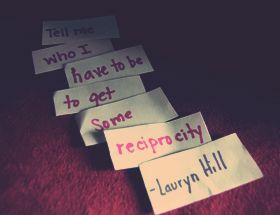 Reciprocity means to return or pay back someone in kind. It is the social norm that governs a human being’s behaviour and is centred round returning similar kind of responses to people. Reciprocity is one of the mechanisms for evolution of co-operation. As far as international relations are concerned, reciprocity means that favours, benefits, penalties which are granted by one country or state to the citizens or legal entities of another nation or state must be returned in kind. Reciprocity theorem in networks relates to the transfer function of passive networks. In the words of Peter Singer, “We see things like reciprocity which are fairly central to our view of ethics. But if you're talking about a set of worked-out rules on what we are supposed to do then, yes, it is a human product.” Reciprocity is a norm of ethics followed by people who believe in “an eye for an eye and a tooth for a tooth” theory.